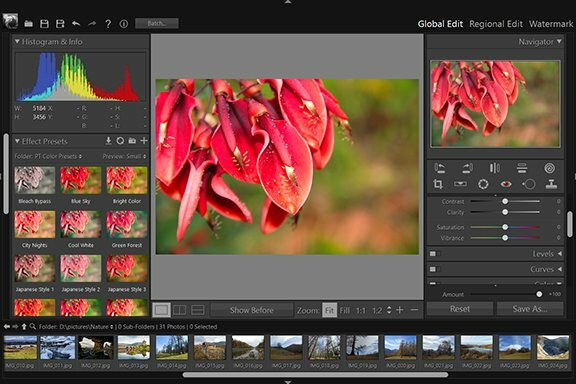 Brush - Regional Edit - User Guide of PT Photo Editor - Easily rescue problem photos. Make every shot its best. The Brush tool lets you to select or deselect the area you paint. 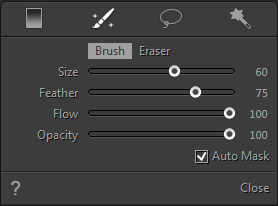 Select the Brush tool in the tool strip or press "B". Brush: Add the painted area to the selection. Eraser: Subtract the painted area from the selection. Drag the Size slider or use mouse wheel to specify the brush size. To make the brush edge softer, drag the Feather slider to the right. 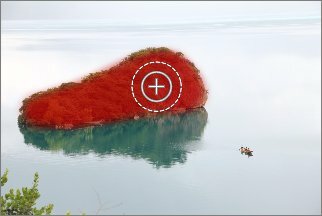 Flow - How much paint is applied to the area for every stroke. Multiple strokes will increase the paint strength. Opacity - The maximum opacity that the brush paints. Auto Mask - Confines brush/eraser strokes to areas of similar color. 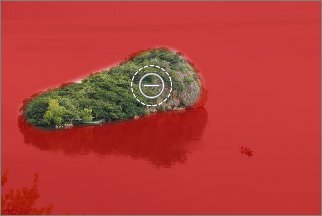 Paint over the image to select or deselect areas.